Many people no longer have any concern or question whether it makes sense to invest in cryptocurrency. Most have decided for themselves the prospects for such investments. However, when dealing with coin management, the issue of choosing a reliable exchange is still a problem. An exchange is used to transfer and exchange digital currencies. It is important to find a suitable exchange that allows you to achieve your desired result with minimal losses on commission, in the fastest time possible. It makes sense to pay attention to platforms with a reliable reputation, like 365cash. Good technical staff and high-quality work allowed 365cash to garner the support of more than 25,000 users. As of now, this figure is still growing. 365cash offers a wide range of payment systems to deposit and withdraw funds. Plus, the exchange supports the most popular digital coins and fiat currencies. 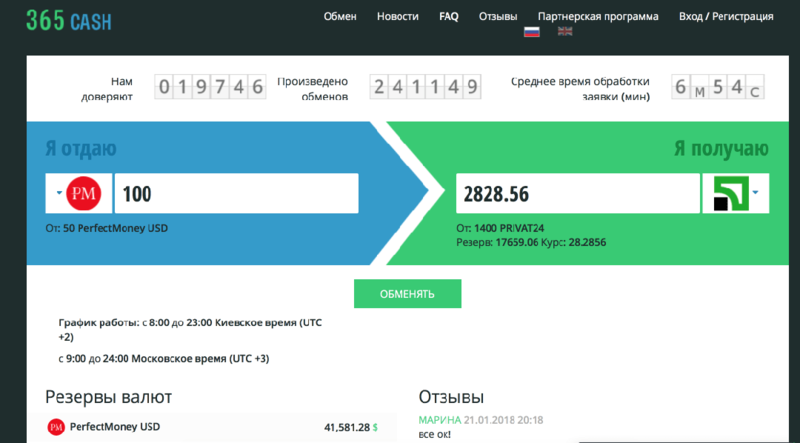 The operation of 365cash is available only from 9-00 to 0-000 Moscow time. The exchange is carried out in manual and semi-automatic modes. The duration of the transaction takes from 5 to 30 minutes in general. 365cash provides special conditions for a number of payment systems. Restrictions include being verified to make a deposit and transfer. Registration is not necessary to use the exchange. However, if you're planning on using the exchange for a long time, it's recommended to create an account. This allows you to participate in stock discounts, as well as referral programs. You only have to supply minimum information. But if you intend to use the banking system for payments, you'll have to supply more information. To make an exchange, select a currency pair and enter the desired amount. The user interface makes all this easy. Be sure to verify the details you entered. After accepting your application, the exchange will be carried out right away. 365cash is a simple and fast exchange suitable for a wide variety of users. Despite a number of certain restrictions, 365cash retains the title of one of the most popular exchanges. If you're looking for a simple, convenient, and fast exchange, it's worth paying attention to 365cash. It's best to read the restrictions first before making exchanges.